Plastic Scribbler has launched their Asterid Open Source 3D Printer on Kickstarter that aims to be the “world’s first $499 fully assembled 3D printer with an 8"x8"x8" build volume". Their new printer offers high-end results without the high-end price tag! Plastic Scribbler has launched their Asterid Open Source 3D Printer on Kickstarter that aims to be the “world’s first $499 fully assembled 3D printer with an 8"x8"x8" build volume". Their new printer offers high-end results without the high-end price tag and makes it easy for anyone to get started in the world of 3D printing. The Asterid 3D printer is supplied completely assembled and ready to use out-of-the-box. Plastic Scribbler will assemble everything from the electronics to the hot-end and wrap it all together with an extruded aluminum frame. In fact, all you need to do to get started when you receive your Asterid 3D printer is unpack it, install the software & filament and start printing! In addition, since their new Asterid 3D printer is completely open source, it will work with all your favorite open source software. In fact, to get you started right away, Plastic Scribbler will supply three slic3r profiles configured for three different print settings, fine, medium and course. Plastic Scribbler will also supply software for Windows compatible computers with every printer they sell. The most important part of a 3D printer is the extruder and Plastic Scribbler has worked diligently to supply the best extruder for the money. The Asterid 3D printer comes with an all-metal hot-end tied to a filament drive wheel driven by a backlash-free timing belt. This combination offers world class results and reliable printing. Plastic Scribbler will be making their first public appearance this weekend at the 2013 Atlanta Mini Maker's Faire on the GATech campus. 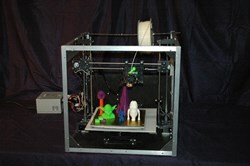 They will offering a first person view of their Asterid 1000HB 3D printer in action. KickStarter backers have the chance to grab themselves a Asterid 1000S for $489 which includes a 204x204x204mm build area. An Asterid 1000HB with a 204x204x204mm build area will set you back $549 but adds a borosilicate glass build surface, upgraded power supply and a heated bed. Check out their Kickstarter page and the plasticscribbler.com website.